Where are you originally from or grow up? I was born in Hong Kong, moved to Hawaii in 1990, graduated from Washington Elementary School, then moved to Seattle in 1990. I have lived here ever since. I went to Ingraham High School, then graduated from the University Washington with Bachelor of Science in Speech Pathology and Audiology in 1999. How did you find Ben Bridge? After I graduated from UW, I worked at Swedish Hospital for a few months. Then I went and lived in Indonesia for about 9 months. After I came back to Seattle, I started applying for a position which related to my major, but life doesn’t always go as planned. While I was typing resumes on my computer, I shopped online at Ben Bridge for a gift for my mother. I thought to myself, “it doesn’t hurt to send in my resume to Ben Bridge since I am looking for a job anyway and I always love shopping for jewelry.” So I did. On the very next day, Bill Wilcox (Manager of the Ben Bridge Flagship Store in Downtown Seattle) called me for an interview and he hired me a month later. That’s how I joined Ben Bridge 9 years ago. What do you do at Ben Bridge? What is the best part about your job? I started out as an Office Manager in the backoffice of the “Flagship” Downtown Seattle Store. Over the years, Ben Bridge had given me many opportunities to learn and grow. 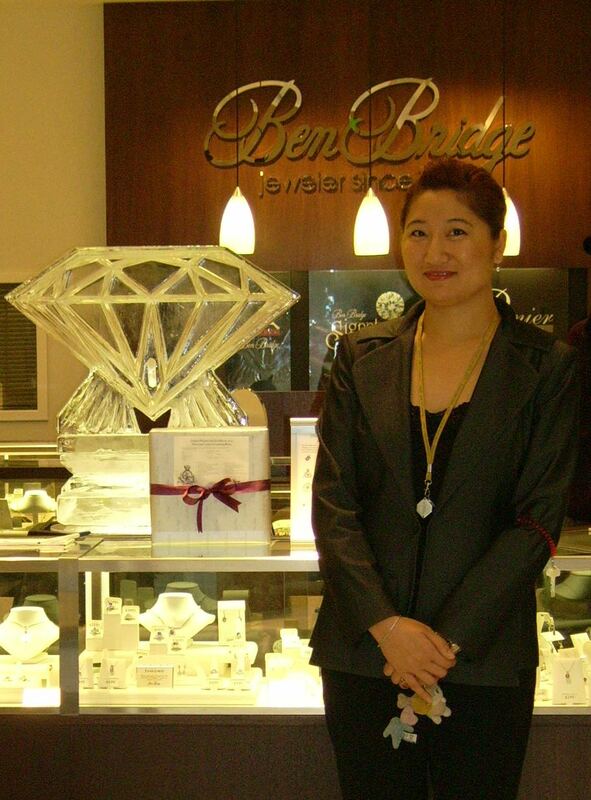 I received my Registered Jeweler (RJ) credentials from the American Gem Society in year 2003, I became a full time Sales Associate in year 2006, and most recently I was promoted to Store Manager and opened the University Village location in year 2008. The best part about my job is to get to know different people everyday. It’s very interesting that even in different cultures, we all still have something in common. A lot of the time, I become close friends with my customers. What is it about the jewelry business that intrigues you? It is wonderful to help a customer find a piece of jewelry to mark a memorable moment in their life knowing that piece of jewelry will be passed onto the next generations with a story. That makes my job rewarding. What is the most interesting thing that’s happened in your store? U. Village is well known as a dog friendly place. I have to say when a customer walks in with his/her dog we tend to recognize the dog before we recognize the customer! Of course, the customer gets all excited when we remember his/her pets! That makes us the most human and pet friendly jewelry store in the Village. Do you have a favorite gemstone or a specific piece of jewelry you own? Why is it your favorite? I have to say it is my stainless steel Rolex Submariner. It’s my favorite because my husband-to-be gave me the watch which marked a special moment in our lives. When I look at the watch each time I remember him and how he gave it to me. It also goes well with my outfit everyday, even with an evening grown for special occasion. Are you a fan of electronic gadgets? What is your choice of mobile device? Not really. My choice of mobile device is iPhone. I think it’s fun to have all the applications ready to be used in different situations. Do you have pets? If so, tell us about them. I have adopted 3 cats from the Humane Society. They are Jess, Misty, and Madeline. Jess is a male, 10 years old and he thinks he is a dog and acts like a dog all the time. Misty is a female, 8 years old and she is a moody one whom loves to eat and sleep (like Garfield). Madeline is a female, 1-1/2 years old and she is the most cute/silly cat, very playful and active. Do you have a favorite charitable cause or organization? Why are you passionate about it? U. District Rotary. Rotary is a fantastic organization. It helps people all around the world. I always had a passion to help children in third world countries, like Indonesia. However, I never had an opportunity or a way of helping until I joined Rotary which gives me a chance to help and gives back to the community. Hopefully one day, I will have my own project and funding to help children in the third world countries. What is your one guilty pleasure? I love eating at McDonald’s. What’s the one fact about you that people might find surprising? I was a ballet dancer. I started dancing ballet at the age of 3 and continued until I was 16. I injured my lower back while I was practicing and had very tough time walking for about 2 years due to the amount of pain I experienced. I still remember, I couldn’t get out of the car, get up by myself or even laugh. That was painful. Fortunately, my family found a good athletic doctor who cured me. I have been able to walk ever since. I even started dancing again 3 years ago in Ballroom dance. If you could have dinner and chat with anyone (alive or deceased), who would it be? Why? Warren Buffett. I think he is one of the greatest businessmen in the last century and it would be interesting to learn how he became who he is today. What’s the best way for people to contact you or learn more about you? Call me at my store (206-729-2413) or see me on Facebook.